As part of an ongoing partnership with professional development schools, UMBC’s education department and Center for Art, Design and Visual Culture (CADVC) hosted Arbutus Middle School students and teachers on campus October 26 and Nov 2 to learn about environmental art and artists. During the program, students participated in an instructional session about artists Andy Goldsworthy and Scott Wade, learned about the elements of art, and defined terms such as ephemeral art and reverse graffiti, among other topic areas in environmental art. 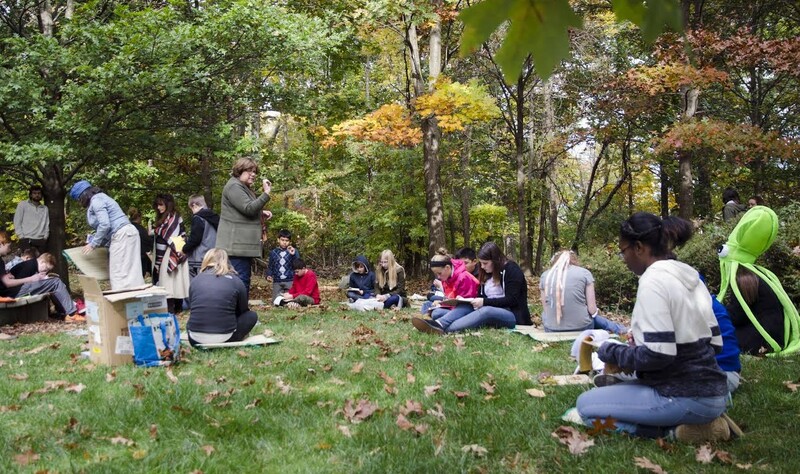 Students then learned about the process of creating nature journals, walked over to the Joseph Beuys Sculpture Park, and after completing outdoor observation work, they worked on sketching and journaling activities. The students’ completed art projects will be featured in an exhibition on campus. “It is important for CADVC’s Educational Outreach Program to partner with professional development schools such as AMS because it allows us to make our gallery exhibitions accessible to K-12 groups and the families of those students. This is our mandate as we are a community art institution as well a gallery for the campus, and we receive Maryland State Arts Council grant funding for this purpose,” shares Sandra Abbott, curator of collections and outreach for the CADVC. Beginning November 12, the student artwork will be displayed as part of an exhibit titled “Natural Connections: Linking Art and Nature,” UMBC’s K-12 Educational Outreach Exhibition, Fall 2015. The exhibit runs until December 17 and is open to the public in the hall gallery on the first floor of the Fine Arts Building.